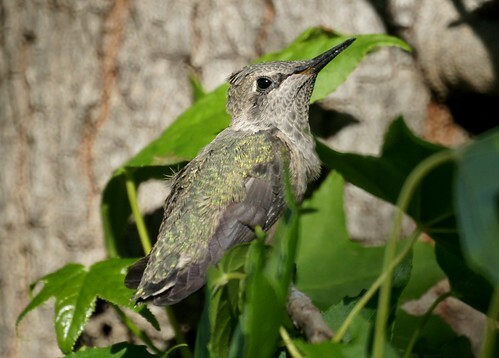 Chris found a hummingbird fledgling on our driveway. The high winds might have blown it out of its nest. It was pretty good at flapping its wings, but the tail feathers might have been a little too short for flight on a windy day. She couldn't find the nest so she moved it to a branch of a nearby tree and named it "Sweet Pea." After a while, the mother came over, checked on it and fed it. It stayed overnight, and we saw the mother near it in the morning. It was gone by noon and we hope it flew off when the winds died down.